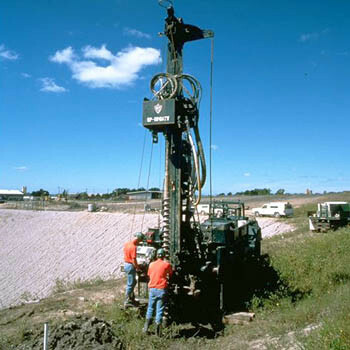 Geoprobes, Soil Borings & Gas Sampling Drilling Services by TSC for Illinois, Wisconsin, and Indiana. Rivers. Lakes. 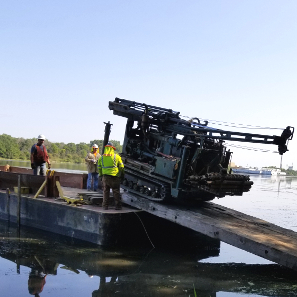 Wetlands...From fields to forests; parking lots to residential structures or large commercial facilities, TSC All-Terrain delivers total drilling performance - on time and on budget! At Testing Service Corporation, we feature start-to-finish staking, on-site drilling and sampling, and geotechnical laboratory testing. TSC's Drilling Department provides support for its internal engineering staff and outside consultants. Applications include general construction, landfill design and regulatory documentation, ground water sampling, underground storage tank evaluation and real estate transfers. TSC owns and operates one of the region's largest and most versatile drill rig fleets, with unsurpassed All-Terrain capability. Whether your need is skid-mounted, angle-hole, large diameter auger, packer testing, rock coring or air/mud rotary - no location is too remote. Exclusive TEC "Anteater" high-volume airlift pumps deliver unsurpassed purging performance for well development. Stainless steel water tanks and high-quality well materials promote contaminant-free results. Experienced staff...All-Terrain versatility...exacting workmanship and dependable on-time performance - supported by proven reporting and recommendations. TSC's reputation for excellence is your best path to quality results. Comprehensive All-Terrain capability speeds completions. Meticulous monitoring well workmanship reduces cross-contamination risks and improves sampling quality. ASTM conformance reduces client liability, fosters quality results. Fast job turnaround assists planning, speeds real estate transfers. Reliable engineering reporting and quality materials promote dependable performance. 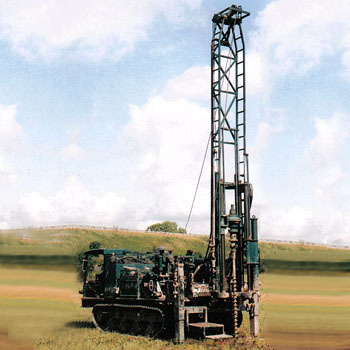 Whether you need geoprobes, soil borings, rock corings, gas probes or something else, TSC has a long history of getting the job done right. Give us a call today.